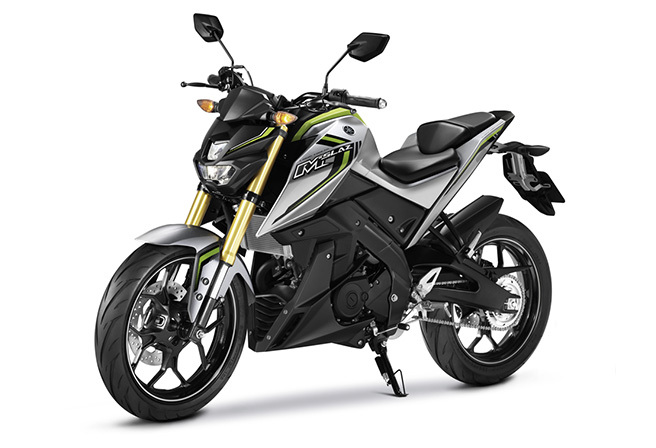 Yamaha Motor to Release M-SLAZ in Thailand, Dynamic New 150cc Sports Featuring Inverted Front Fork - News Releases | Yamaha Motor Co., Ltd.
IWATA, December 2, 2015—Yamaha Motor Co., Ltd. (Tokyo: 7272) announced today that the new 150cc sports model, the M-SLAZ - a motorcycle that fits with global trends by featuring its extreme sports feel design balanced in harmony with around-town practicality - is scheduled to be on sale in the Thai market from December 2015. Manufacture and sales of this new edition are to be carried out by the Thai Yamaha Motor Co., Ltd. The M-SLAZ was developed based on the concept of "Just Size Ultimate Fashion Street Extreme".The engine and chassis have been developed off the platform of the sports model YZF-R15 which has won popularity in the Asia region to provide new dynamic styling concentrated around power as well as superior maneuvering agility. The main features of the M-SLAZ are: 1) High-rigidity inverted front suspension that achieves a superior riding performance 2) Enjoy a sense of oneness with the bike’s fun-focused upright riding position for urban use, 3) External design based on a "Street Extreme" image, 4) A LED headlight with an advanced and minimalist presence and much more.